Nanoscience and nanotechnology journals cover latest findings and research at nanoscale. Integrated Science publish specific journals to cover your research in nanoscience and nanotechnology. 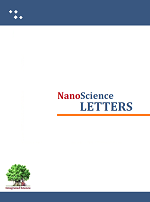 View Journal | Current Issue | Register Nanoscience Letters is meant to serve a rapid forum for publication of basic and applied research in nanomaterials, nanoparticals, chemistry and physics at nanoscale, nanotechnology and allied areas. View Journal | Current Issue | Register NanoMedicine Letters is meant to serve as a rapid forum for publication of research at nanoscale with potential of application in drugs and medicines development and delivery. All areas are covered which can lead to development of therapeutics, drugs, delivery system, diagnosis or having medical applicability. a journal to cover the research at nanoscale for drug development and drug delivery. The Journal of Ayurveda and Ancient Therapies is a rapid forum for publication of reasearch articles from the traditional knowledge of science of Ayurveda and other alternative system of medicines. The journal is meant to spread the embedded knowledge of traditional sciences and to provide updates of research in Traditional medicine science. Articles related to Ayurveda from all the branches like Kayachikitsa, Roganidana, Panchakarma, Siddhanta & Samitha, Rachana Sharira, Kriya Sharira, Dravyaguna, Rasashastra, Bhaishajya Kalpana, Shalyatantra, Shalakyatantra, Prasooti & Striroga, Kaumarabhritya, Swasthavritta & Yoga, Agada tantra. Yoga practices and its uses in modern times. Siddha and Unani medicines. Accupressure, Acupuncture and Chinese Medicines. Homeopathy, Naturopathy. 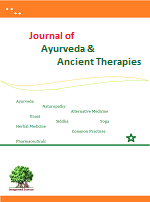 The Journal of Ayurveda and Ancient Therapies covers modern research in Herbals medicines, Ayurveda and other Alternative system of medicine, Pharmacognosy, Pharmaceutics, Analytical Chemistry, Quality control, Botany, Ethnobotany, Ethnomedicine, Ethnopharmacology, Pharmacology, Pharmacovigilence, Toxicology, Bio-technology, Bio-chemical research studies of Ayurveda, Unani, Shiddha medicines and scientific report studies of prevalent practices for human health. The review articles, research articles and short communications are published from research in above fields. Journal publishes Insights on topics relevant to Ayurveda, Yoga and Traditional Medicines. Insights are briefs of current influencers on human health. Insight are named in the journal according the field covered like AyurSight (insights from Ayurveda), YogaSight (Insight from Yoga), AcuSight (Insights from Acupressure and Acupucture), NatSight (Insights from Naturopathy). Alternative medicine refers to all the traditional systems of medicine – Ayurveda, Siddha, Homeopathy, Unani, Tibbi, Chinese, Folk-lore practices and all other existing classical systems worldwide. The Insights from all forms of Alternative Medicines are published in the journal. Recent clinical investigations on use and application of alternative therapies are published in clinical reports section. Notes are small description on any of issues related to use, benefit, application, remedy, observation (scientific) that can serve an information resource for research and medical community. These notes could be from anyone like general populace or researcher. This journal will be a bridge between the traditional knowledge of science along with the latest advancements to meet the standards set for globalization. Many major institutes and research centres are currently involved in exploring the opportunity to investigate newer drugs from ancient principles of Ayurveda and other alternative system of medicine. This journal will be a mirror to reflect the embedded knowledge of traditional sciences. Updates on research in Traditional medicine and to promote research among students of Ayurveda and other alternative system of medicine. Research and review articles related to Ayurveda from all the branches like Kayachikitsa, Roganidana, Panchakarma, Siddhanta & Samitha, Rachana Sharira, Kriya Sharira, Dravyaguna, Rasashastra, Bhaishajya Kalpana, Shalyatantra, Shalakyatantra, Prasooti & Striroga, Kaumarabhritya, Swasthavritta &.Yoga, Agada tantra etc. Ayurvedic M. Pharma, & Ph.D. research works etc. Herbals are the main source of Ayurveda and other Alternative system of medicine. Original literary studies, literary criticism and critical editing of the original writings of Ayurveda and other alternative systems of medicine will also be accepted for publication. All submissions are subjected to peer review process before publication.